Johnny and June’s is a refreshing change for those that are sick of event spaces that are cookie-cutter and unoriginal. This gorgeous and unique space has industrial décor, a vintage feel and brick to give it a warm charm unlike any other space out there. Not only is Johnny and June’s a unique venue, but it is also the perfect place for parties as large as 350-400 guests! This makes it perfect for corporate events, weddings and other big events. If you are planning a wedding, make sure to check out their wedding packages. They are sure to have the right package to suit your needs. Johnny and June’s is also a great place to catch a show! They host events throughout the year that are tons of fun. 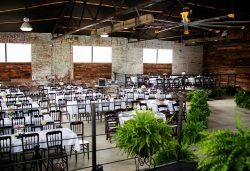 For a truly unique and inviting event space, check out Johnny and June’s. You won’t be disappointed. Booking Howl2GO Dueling Pianos’ world class show to your Flora, IL event couldn’t be simpler. From conventions to corporate events, weddings to fundraisers, our unbeatable Dueling Piano shows bring a high energy, interactive show that your guests will remember for years to come anywhere in Illinois!